Net Weight: Packet (25 seeds)1oz (200 seeds)(+$7)1/4lb (800 seeds)(+$16)1lb (3200 seeds) (+$38) This item is currently out of stock! This variety supersedes all other Nasturtiums. The brilliant colored flowers bloom above the foliage, rather than being hidden by leaves. Will blossom freely when not allowed to go to seed, and colors are most delicate. Ideal for cutting. Dwarf Jewel is easily grown in any soil and blooms profusely for a long period. 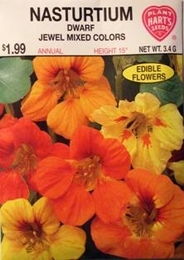 Nasturtiums require little water and no fertilizer as enriched soil tends to produce more foliage than flowers.